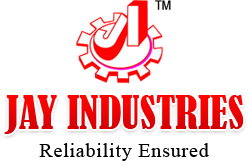 Incorporated in the year 1982, Jay Industries is reputed name, engaged in the manufacturing and supplying of wide range of Industrial Machine. Our company is headed by Proprietor Mr. Harshadbhai Solanki who has a vast experience of 25 years and profound knowledge in this domian. Based in Bhavnagar, Gujarat, we have been successfully catering to the requirement of various industries by offering them top notch range of Industrial Machine. Our company is supported by a strong infrastructural base and dedicated team of professionals. Our team has an immense knowledge and experience in this domain that help in smooth working of the business. Further, our infrastructure is equipped with 8 German Make Machines that enable us in manufacturing 25 pieces per month. Quality is our prime concern and for that we follow stringent quality policy where our experts check the products on different parameters in order to meet high quality standards. The products undergo quality check at each stage right from the procurement of raw materials to manufacturing and till the final dispatch. With our superior quality products, we are able to cater the clients in the most fruitful manner. In order to ensure high quality standards, we stringently check the products so that impeccable products reach the clients. Further, these products are timely delivered to the clients at the stipulated timeframe.